Hello & welcome to Splurge or Save! The game where you test your style skills. The last round was all about the chunky boot. It seemed pretty even; some of you were fooled & others got it right. You smarties! This round we're talking about evil eye necklaces. The evil eye has been a symbol of protection in various cultures for thousands of years. 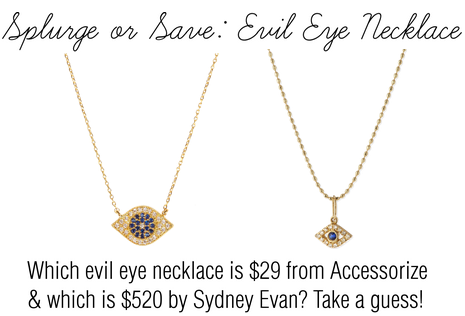 Can you pick out the $510 gold evil eye charm necklace by Sydney Evan versus the more affordable $29 evil eye pendant from Accessorize? Can you determine which is the Splurge piece? Take a look at the photos & make your decision. Hey hey, no peeking! The Sydney Evan 14k Gold Tiny Evil Eye Charm Necklace retails at $510. This luxurious pendant charm necklace is made from 14-karat yellow gold, white diamonds, & bezel-set blue sapphire center. Talk about classy. Phew. That sounds pretty fancy to me! Meanwhile, the Accessorize Evil Eye Pendant Necklace retails at $29. The pendant is exclusively designed by Zara Simon as part of the Z for Accessorize range. It's a gold-plated chain necklace with an evil eye amulet. The deep blue & clear cubic zirconia stones give it a hint of shine. I do, actually, prefer the more expensive one. I just find it less complicated and less busy. But I wouldn't buy it because I have other places to spend $500. I guessed right surprisingly! I really love evil eye jewellery, I just can't put my finger on why! Oh hell no, I actually much prefer the one on the left, I find it to be more 'me' and much prettier too. Wait, what?! The one on the left looks sooooo much more expensive and prettier! I'd defo go for the Accessorize one, then! Really love evil eye jewellery - It's so fastidiousness!! These are both so pretty *u* I prefer the more expensive one as well, but I really like both! I definitely prefer the one on the left! I would literally not have been able to guess haha. They're both lovely, but I would totally buy the less expensive one! I guessed right. I like both. The cheap one is a great copy if you don't want to splurge. I think the first is the most expensive one, because the chain looks like real gold you know... Hmmm, hard one. I think the one on the right is so much prettier! I would never have guessed which one was the pricier one! Both are gorgeous! 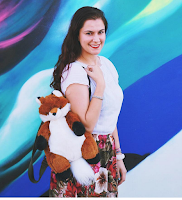 say you on a comment in the Looks like Rein blog (Cherein). Love your site. I'd post a link to her blog but that's not the intention.